Prison inmate Shane Todd — who has been convicted of sexual assault — has now been on the loose for seven days, the police said at a press conference this morning [July 6]. 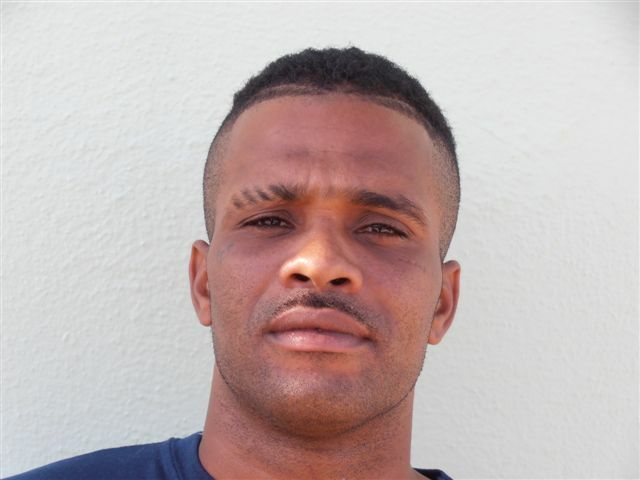 36-year-old Shane Todd started serving a prison sentence in 2005, and was enrolled in a “re-entry programme” at the Prison Farm and was out on work release when he failed to return last week. Acting Chief Inspector Andy Morgan said, “We are now 7 days into the joint Corrections & Police manhunt for Shane Todd. We are going into the weekend when there are more people about and we are urging people to be extra vigilant. “In 2005 Mr. Todd commenced a 15 year sentence for burglary and sexual assault. He was approaching the end of his sentence and in a reentry program with the Corrections Dept. “He failed to return to the Prison Farm on Friday 29th June after his day release work had finished. Our overall aim is the safe return of Mr. Todd to the Prison Farm to continue his sentence and receive the care and support he needs. “Despite Bermuda’s small size, our previous experience in dealing with escaped prisoners has taught us that it is very difficult to locate and apprehend them without the help of the community. Ur on ah roll cuzzy!!!! U R on ah roll cuzzy? You sound really stupid! Instead of encouraging him to turn himself in you encourage him to continue to break the law? With family members like you, its no wonder he’s spent a chunck of his life behind bars. He probably sexually assaulted you as well. Some real ignorant people on this island. What’s funny about this? I guess brain damage runs in the family. Am I reading it correct…he was sentenced to 15 years in 2005 and was getting ready for release…according to my math he shouldn’t be out until 2020!! Serving less than 1/2 of his sentence and he was convicted of sexual assualt. Hopefully he’ll be given the rest of his sentence as punishment for running away! Why wasn’t the public told the first time they reported this that he was a imprisoned for sexual assault? Were they trying to hide the fact that he was “missing”, or whatever you want to call it and his offence was sexual assault? Why did they also wait so long to tell the public? What if he had sexually assaulted someone else? Or even worse? 15 years, sentenced in 2005 and out already? This is not good at all. All of this and he’s being “reintroduced” back into society? What is wrong with Bermuda’s justice system? Why are they taking this so lightly like he’s just some petty criminal? They should be out in full force looking for this guy. And here is what Mr. Lamb had to say about him two days ago. Commissioner of Prisons Edward Lamb told the Bermuda Sun yesterday: “I can confirm that an inmate failed to return to the Prison Farm while on work release. “We are currently working with police and his family to locate him and return him to our custody. Imo, this shows me this man is incompetent at his job. And I don’t want to here excuses as I am tired of excuses. we need straight answers. Exactly he is incompetent and this has been shown time and time again yet he retains his position. This is ridiculous. This guy is by no means “low risk”. If he intentionally mislead the public then some heads need to roll but of course that won’t happen. A few weeks will go by, people will forget, this psycho will be fully released and we will still have incompetent, deceitful idiots running things. A low risk to the public. 5 women sexually assaulted, and Col Lambe tells us he’s a low risk. This, ladies and gentlemen, is the kind of moron making decisions about who gets to be let out on the prison farm. A full week has to go by before they tell what kind of scumbag he really is. Totally agree with you Get it Together. This guy should not have been on a work release programme, no matter how many years he’s been there. We all know you can;t rehabilitate sexual asaults. Col Lambe needs to be replaced at once! They should make him serve the full sentence now. You can see that he hasn’t learned jack shizznit! It’s that or the victim’s family caught him and dealt with him. yo!! ya heating up di fu(**ng streets yo!! police every were guys cant even travel with out gettin pulled over you better turn yourself in beacause police keep blocking off the road lookin for you jus no di police aint gone be di only ones lookin for u real people gone get fed up n come get u so do wats right…. C’mon people, let’s find this freak and lock him up. Mad dogs get euthanized…too bad we can’t do the same for people like this and save a lot of time and funds.